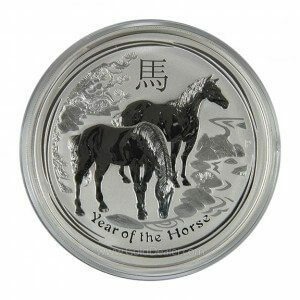 The 2014 Australian Lunar Year of the Horse Silver Coin is part of the Perth’s Mint Lunar Series II program. The entire series is very popular and draws from the Chinese Lunar Calendar and includes the 12-year Chinese Zodiac which indicates people born under the horse sign are energetic, out-going, warm-hearted and intelligent. The entire Lunar series is admired worldwide and all Perth products are minted to the highest production and purity standards. The Australian government guarantees both weight and purity which makes for an internationally acceptable series of bullion products. Each Australian Silver Horse Kilo has a legal tender value which is largely symbolic and this sovereign touch is an added investor touch. 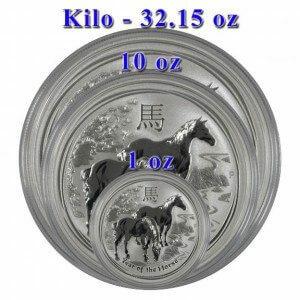 The pure Australian Silver Horse Kilo is housed in a heavy clear plastic container to protect its beautiful surfaces. The front of the 2014 Australian Silver Horse Kilo features Queen Elizabeth II wearing the royal crown and includes the following in block letters: ELIZABETH II, AUSTRALIA, 1KG, 999 SILVER, 2014, 30 DOLLARS. The edge of this massive coin is reeded providing an additional security feature. The reverse of the Australian Silver Horse Kilo features two beautifully portrayed horses, one upright and one drinking from a stream. The distinctive P mintmark indicating the coin was struck at the famous Perth Mint is featured. And Year of the Horse is inscribed at the bottom of the coin with the Chinese character for horse featured at the top of the coin. The usual symbols of good luck and prosperity are included and both the front and back of this important coin features a combination of frosted and mirror surfaces which are both subtle and dramatic. Mintages of the Australian Silver Horse Kilo will be determined by demand in the year of 2014 only so the official dating of this coin adds to its collectability and yet premiums are relatively low. All coins of the Lunar Series have a history of selling out quickly so we encourage you to obtain your annual Lunar coins as soon as they are released.